Doc Burnstein’s Ice Cream Lab and For Good Co. turn profits into clean water. 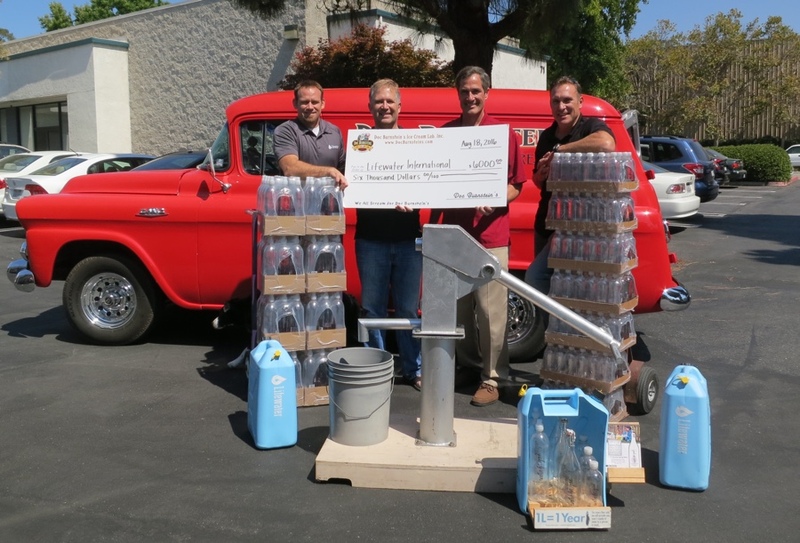 Doc Burnstein’s Ice Cream Lab and For Good Company worked together to help a community in Africa get a safe water well and improved sanitation through sales of bottled water and donations in Burnstein’s ice cream stores. Together, the businesses raised over $6,000. “We helped bring clean drinking water to an entire community for years. There are few ways our efforts could make a larger impact on lives than this.” states Greg Steinberger, Founder of Doc Burnstein’s Ice Cream Lab. He challenged staff to increase sales of Water for Good, For Good Co.’s bottled water product, as well as ask for donations. Support of the water project follows Doc Burnstein’s 10% Giving Back Pledge. Over 600 million people worldwide do not have access to safe water, and nearly half of them live in Sub-Saharan Africa. Almost 2.4 billion do not have a safe place to go to the bathroom. This leaves vulnerable children and families in a cycle of poverty and disease. With safe water and sanitation, education, health, and productivity improve and families can lift themselves out of extreme poverty. Lifewater International, a San Luis Obispo-based non-profit water development organization, will complete the water and sanitation work. With experience in more than 40 countries since 1977, Lifewater has served over 2.5 million people by partnering with underserved communities to overcome water poverty, Last year alone Lifewater served over 50,000 people with safe drinking water. Since 2013, the For Good Company, in cooperation with Lifewater, has raised enough funds to drill six water wells in Africa through the sale of bottled water and other products. “Our goal is to one day see the Central Coast be responsible for 100 clean water wells, making a monumental impact on the communities the wells will serve,” states Eric Wildey, For Good Co. Spokesman. Products carried throughout the Central Coast include Water for Good, Coffee for Good, and Tea for Good. Purchasing just one liter of Water for Good results in a full year of clean drinking water to a person in need. The well funded by the Doc Burnstein’s Ice Cream Lab and For Good Co. is expected to be completed later in 2016. Information on the project is available at lifewater.org.